A commenter on another blog commented, "I'm finding it difficult to buy my "everyday" (retirement in rural village) clothes. I need practical things and somehow they all seem just too basic to get excited about, even though they are well-coordinated." I posted a brief reply, but wanted to expand my thoughts here. My rural-village-living friend Gaye works part time as a costume designer in the film industry. At home in rural Ontario, she wears clothes that lift her out of the generic, country-mouse look yet fit the practical requirements of small-town life. Most can also be worn while working. She is a classic dresser, loves scavenging in thrifts and consignment, and always looks like she spent a great deal more than she did. Gaye knows how to mix high and low. She likes the versatility of vests and adds one under a light coat or field jacket to add a colour zhuzh. 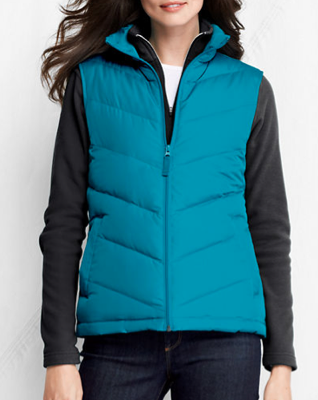 (Shown, Land's End down vest, about $60). 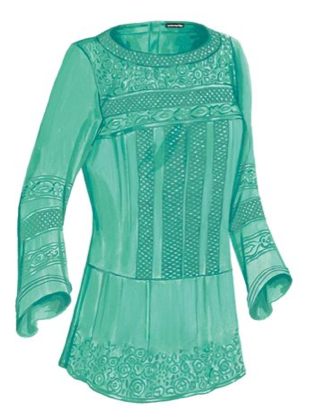 She would also wear it with the skirt, over a gray or cream turtleneck. Working with hues is way more interesting than exact coordination. She spends time driving, and doesn't want to haul shoes here and there. She and I wear Blundstones: tough, perfect for all but the tallest drifts, and kick on/off. Gaye's are "Crazy Horse Brown", and she slips sheepskin insoles into them. If she must swap, she tucks a pair of ballet flats in her bag. Gaye said a coat she can wash is her ideal; she can't always get to a dry cleaner. 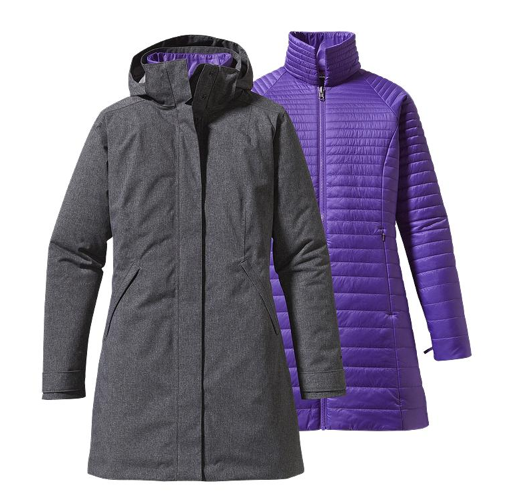 Patagonia's Vosque 3-in-1 parka ($469) fits the bill: a zip-out liner, a waterproof outer shell, a hood, a versatile grey colour with its kick of violet shell, a shaped, feminine fit—and washable. Finally, Gaye wears jewelry, nearly always gold gypsy hoop earrings, and a whopping sapphire that was an engagement ring from a former marriage, now reset. Just because she's in the country, she does not leave the good pieces in her drawer. No such gems in your past? 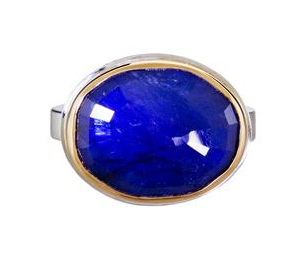 Not to worry; a ring like Jamie Joseph's blue sapphire cabuchon (13mm x 14mm) provides the punch. A retired villager need not scamper about in dull clothes; she just has to cast her net a bit wider. And, Gaye would add, stay interested not so much in trends as in the joy of colour and the pleasure of good fabrics made into well-constructed pieces. Great post Duchesse. I'm not a retired villager, but spend a good bid of time at our rural farm and its environs. 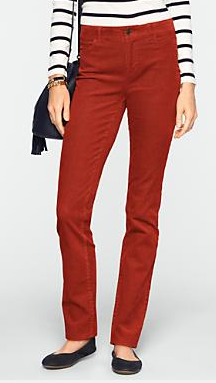 Now, if I could just force myself to purchase pants that are not neutral in color! 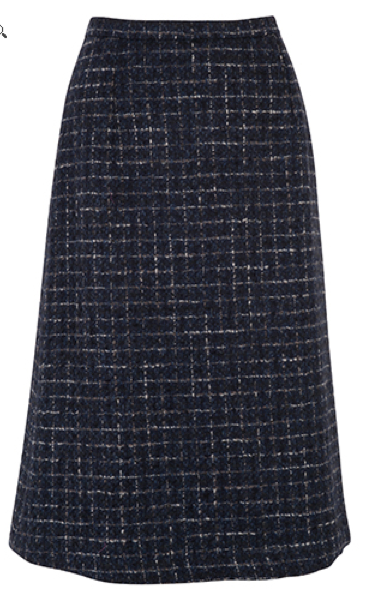 I Love that Brora skirt! So much of what you suggest here would work well for my island lifestyle as well. Oh now I want to move to a village! I have two vests and a puffy down coat and short boots similar to the Blunstones so I could play a bit. I have looked at bright jeans and cords but they don't suit my short frame...there are some things that us height challenged gals just have to avoid. I could go for the big sapphire though! All very nice, and I WANT that Patagonia coat! materfamilias: Yes, and coincidentally she and her husband recently bought a house on Saltspring Island! hostess: She is about 5'3". I wonder if colour is more a matter of preference than height? I noticed Talbot's carry coloured cords in Petite and Woman Petite. So glad you did this post which isn't exclusive to the country dweller, but to the telecommute worker, too, whom, like myself, enjoys getting dressed to greet the day (as opposed to plugging into work clad in PJs! ), but not *overly* dressed. Your "thumbnail sketch" of Gaye's wardrobe choices appeals to me. Like yourself and Gaye, I wish I could wear Blundstones. Alas, they are not available in narrow widths. 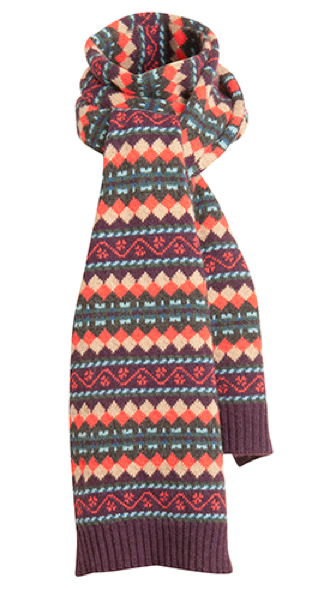 LPC: Those are chic yet relaxed sweaters! Dee: Don't give up, you might be served in the Chisel Toe Blunnies. This is from Blundstone's site: "Blundstone cuts the Chisel Toe style just so, for a clean, trim look that fits a narrow to medium foot width..."
Duchesse, a million thanks to you. That was my post! And I just love your thoughts via your friend. Today I brought out of retirement some vintage tweeds, a skirt I had tailored in London, a beautiful hacking jacket, and a 1940's boxy shirt-jacket with flange shoulders and big buttons. None of these has much color beyond rich neutrals, but I wore a big topaz ring (old) and short russet boots from England c.1968 with my "outfit". It's a start. And it's a great post. I love this array of country chic. Beautiful choices. And @Swissy--I used to have a few of those 1940s shirt jackets (mine were Pendleton). I can't figure out what became of them. I wish I had them now. Frugal, I am so glad I still have this... garment. It's good to wear indoors over a lighter tee shirt or outside over a sweater. It has gigantic patch pockets, so handy. It's a checked tweed in brown, rust, navy and ochre, not my colors now, but I loved wearing it again today here in NH. 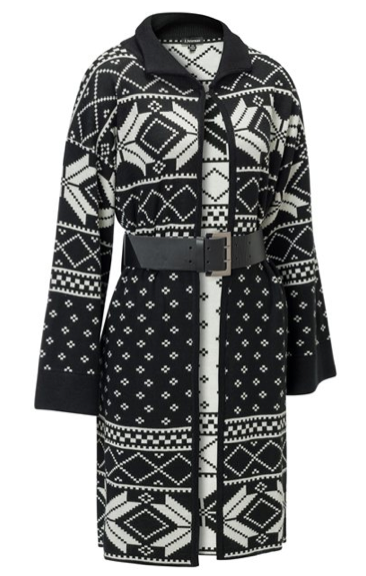 Swissy: Oh, your clothes are a wardrobe designer's dream! Gaye would go crazy for them. So happy they are out of the trunk. frugal: Were yours the Pendleton '49er jacket? 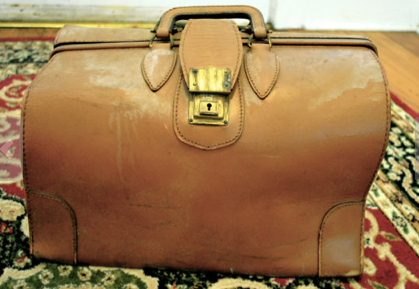 I have flirted with buying one (new or vintage) for years. I have a newish (10 years) 49er's Pendleton jacket out at our farm. I'm always concerned that moths will get to it. Susan: Any fine wool is vulnerable, but it is possible to keep them away. In my experience it's the 'forgotten', undisturbed pieces that they hit, and-as others here have said-anything with a little organic dirt, even that which you do not see. Great post. I think these could all work just fine for retirement in the city as well - casual and comfortable with polish and flair. What a great post! All pretty much irrelevant to my lifestyle, but lovely suggestions nonetheless and nice to dream of later years in a cute village! mufflers, clean line artsy earrings or fine , small signature jewelry help. I think the biggest problem of country style is finding and regularly using a good hairdresser/colorist. I would also suggest not buying too much right away. My early purchases were not casual enough and didn't get worn. It takes a few years to adjust. So - my purpose in writing this is to thank you. You may have a lot of readers who are already familiar with the more unique and elegant clothing retailers/boutiques and who have access to their brick and mortar stores. I do not, and I love finding new ones online. Anon@ 3:34: Thank you so much! I feel like you- so many retailers offer the same merchandise. You have encouraged me to keep searching and writing. Sometimes reader think bloggers like me do this because we are driven, but without occasional encouragement, I would stop. Don't stop! I've been so encouraged by your thoughts, from entertaining to dressing. Thanks for the effort and the presentation as well. Bracelets: Is dash worth the cash?